This chapter describes the management tools available with the Oracle HTTP Server. It includes information on Oracle HTTP Server management, how to access Fusion Middleware Control, how to access the Oracle HTTP Server home page, and how to use the WebLogic Scripting Tool (WLST). Configuration Wizard, which enables you to create and delete Oracle HTTP Server instances. For more information, see Installing and Configuring Oracle HTTP Server. WebLogic Scripting Tool, which is a command-driven scripting tool. For more information, see Understanding the WebLogic Scripting Tool. Section 3.1, "Administering Oracle HTTP Server Using Fusion Middleware Control"
Section 3.2, "Administering Oracle HTTP Server Using WLST"
The main tool for managing Oracle HTTP Server is Fusion Middleware Control, which is a browser-based tool for administering and monitoring the Oracle Fusion Middleware environment. This section described some of the basic Oracle HTTP Server administration tasks you can perform with Fusion Middleware Control. Section 3.1.1, "Accessing Fusion Middleware Control"
Section 3.1.2, "Accessing the Oracle HTTP Server Home Page"
Section 3.1.3, "Understanding the Oracle HTTP Server Home Page"
Section 3.1.4, "Editing Configuration Files Using Fusion Middleware Control"
When you select a target, such as a WebLogic Managed Server or a component, such as Oracle HTTP Server, the target's home page is displayed in the content pane and the target's menu is displayed at the top of the page, in the context pane. To display the Oracle HTTP Server home page and the server menu, select an Oracle HTTP Server component from the HTTP Server folder. You can also display the Oracle HTTP Server menu by right-clicking the Oracle HTTP Server target in the navigation pane. Section 3.1.3, "Understanding the Oracle HTTP Server Home Page" describes the target navigation pane and the home page of Oracle HTTP Server. General Region: Shows the name of the component, its state, host, port, and machine name, and the location of the Oracle Home. Key Statistics Region: Shows the processes and requests statistics. 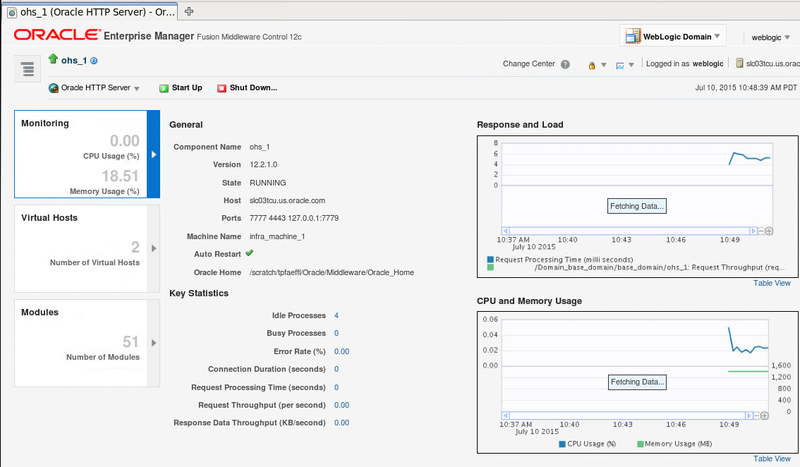 The Advanced Server Configuration page in Fusion Middleware Control enables you to edit your Oracle HTTP Server configuration without directly editing the configuration (.conf) files (for details, see Section 1.6.3, "Modifying an Oracle HTTP Server Configuration File"). Be aware that Fusion Middleware Control and other Oracle software that manage the Oracle HTTP Server configuration might save these files in a different, equivalent format. After using the software to make a configuration change, multiple configuration files might be rewritten. For instructions on how to edit a configuration file from Fusion Middleware Control, see Section 5.1.2, "Editing a Configuration File for a WebLogic Server Domain." The WebLogic Scripting Tool (WLST) is a command-driven scripting tool. For detailed information on WLST, see Understanding the WebLogic Scripting Tool. For more information on the WLST custom commands that are available for Oracle HTTP Server, see Appendix A, "Oracle HTTP Server WLST Custom Commands." Section 3.2.1, "Oracle HTTP Server-Specific WLST Commands"
Section 3.2.2, "Using WLST in a Standalone Environment"
WLST provides Oracle HTTP Server-specific commands for server management in WebLogic Server Domains. For more information on the commands, see Appendix A, "Oracle HTTP Server WLST Custom Commands." The following are online commands, which require a connection between WLST and the administration server for the domain. Oracle recommends that you use the ohs_createInstance and ohs_deleteInstance commands to create and delete Oracle HTTP Server instances instead of using the Configuration Wizard. These commands perform additional error checking and, in the case of instance creation, automatic port assignment.